World building used to be easy, you would simply become the biggest bloke in the tribe and go and invade a neighbouring village. For some reason this is now frowned upon, so we must play games like Terraria to get our megalomaniac hit. The game launched March 27 on XBLA and we gave it an iffy 2.5 out of 5, some bugs needed to be fixed. Attempts have been made to improve the experience so check out the full list of fixes and updates that will hit next time you boot up the game. The XBLA version of Terraria is 4 player local co-op and 8 player online. Our review described this version as being a "glitchy mess". It is likely that the new patch will fix some issues, but the fundamental problems with controls may remain. 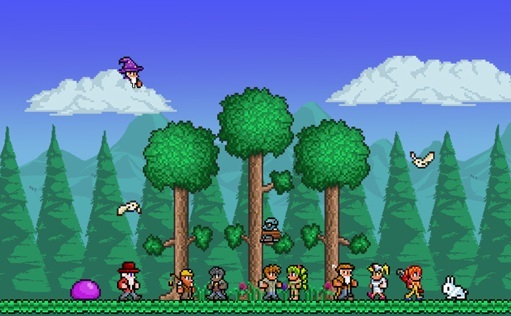 Let's hope this patch, and more in the future, raise the console version of Terraria to the heights of the PC version. Fixed - Non Host Player Cannot Enter Into The Underworld. Fixed - The Non-hosts Screen Turns Black After Reaching The Bottom Of The World. Fixed - Going From A Small World Into A Medium Multiplayer World Would Cause The Medium World To Section Off For The Player . Fixed - Game Crashes After Using Whoopie Cushion. Fixed - Non Host Returns To Launcher Screen When Host Uses Rainbow Rod Or Any Other Magic Projectiles. Fixed - Host-fired "Magic Missile" multiplayer crash. Fixed - Handheld Torch light not visible to online players, only user holding torch. Fixed - "Airtime!" Achievement given during grapple. Fixed - Hellforge's are not spawning in hell. Fixed - Crash when water pumps are placed a significant distance apart. Fixed - Title Crashes After Turning On The Switch Which Is Hooked Up With A Log Line Of The Wires. Fixed - Incorrect Text Is Displayed In Loading Tips. Fixed - SPLITSCREEN: The Game Just Went Dark And Went Back To Xbox Main Menu. · Fixed several multiplayer issue where players would be at incorrect positions, items could not be picked up and part of the world would not load properly. Page created in 0.4084 seconds.